Another day, another teaser. Fresh on the heels of the leaked Angry Birds Rio Smugglers’ Plane images comes these images of the what will likely be be the next Angry Birds Seasons update. “Wreck the Halls” — or so it’s currently called — will be a Christmas / Wintery holiday theme. I normally don’t post something like this so early, but if you guys are anything like me I just can’t get enough of Angry Birds Seasons — especially this time of year. The images below obviously came from Game Center, but that’s all I will say about them at this point. 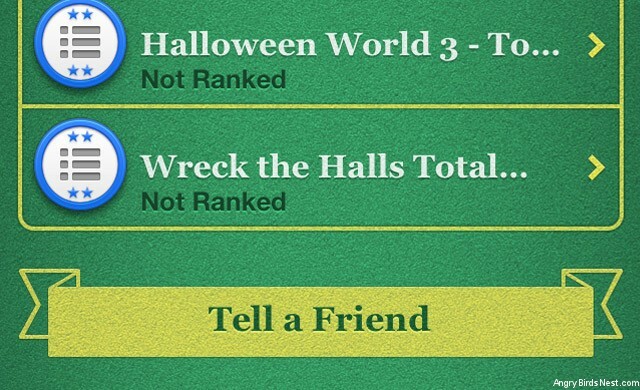 Update: At about 2:00 PM PST the “Wreck the Halls” icon, total score leaderboard, and achievements started showing up in Game Center. This could mean an update will land soon. If it’s an advent calendar (i.e. one level per day) like Seasons Greedings I’d expect to see it land tonight and contain 25 levels. Time will tell! Note, the four new achievements are hidden. There is no info on whehter it will be a full release or one level per day. I know many of you will disagree, but I hope for the advent style again. The name and icon could change. I hope the name sticks though, as it’s great. Will there be an explosive glitch that turns pigs into dynamite? One can wish! Without further adieu, here are the images. A BIG high five \o/ to [you know who you are] for tipping us off to this. The new title & backdrop was seen in the angry birds shop! Good catch! The new logo looks interesting… looking forward to it! Probably coming out next month. 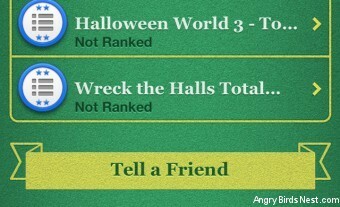 If Wreck the Halls is released on December 1st, then we could start seeing new game center achievements popping up by tomorrow. Let’s hope. Anyone else think so? BirdLeader and I were actually just having this conversation about an hour ago. 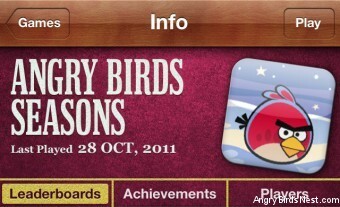 We both hope for a 1 Dec., advent-style release, but Rovio hasn’t given any hints about it. As a “Devil’s Advocate” re: achievements, it is possible that Wreck the Halls is a scheduled release. That is, already submitted (and perhaps approved) by Apple, but with specific instructions that it be released at a specific time. In this case, GameCenter is not updated until immediately before the release. As an example, Summer Pignic was a scheduled release (for the Summer Solstice, 8am UTC on 22 Jun) and we saw no forewarning on GameCenter. Perhaps we will see the same thing here (8am UTC on 1 Dec). Disclaimer: This is all speculation. I just checked Game Center and ran over here to see if there was any hope still for an Advent-style release Dec. 1st. I agree it is still speculation, but at least the insightful details you and BL allows us to hold out hope. Thanks. Seasons is by far my fav iteration of AB, and even moreso when the episode employs the level-per-day scheme. what do u mean u had conversation with bl? how? We have our forms of communication. Obviously, to keep the site running smoothly, the three of us (BL, Fuji and I) stay in touch. +1 hoping for an advent style release. I LOVED last year’s xmas release, hoping this year’s measures up! By the Way, What 1.3.2 version are you talking about Rio or Seasons? And Rio v1.3.2 for PC. i meant rio. sorry. lol n thanks for the info!! Uh oh. 2 days till December and nothing heard from them? 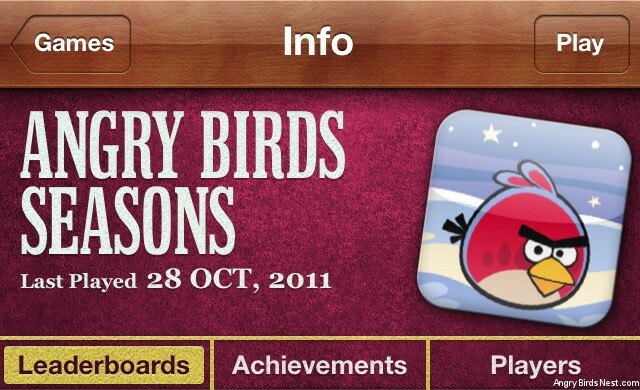 Usually we have game center achievements 2 days before… Maybe it’s not coming till late December. I guess this rules out an advent calendar. Any word on when the Android Update for Rio is coming? As the post says, we have no idea when the update will land for any device. Let’s cross our fingers and hope. don’t updates come 4 hours early. so that means 8:00 on november 31. The level updates for Summer Pignic were 8AM UTC. Good find. For those who want to see, here is the new icon. Yes, Score Addict seems to be only 10pts this time, instead of the usual 30. This is because GameCenter only allows 1000pts total, and ABS was at 924 SD (920 HD) before this update. Now it will be 984/980. So does that mean there will be no more achievements for seasons? That’s not the solution a priori. There is a similar issue with ABo. I believe Rovio will either try to cometo some accord with Apple or create their own system. Yes, that goes along with the achievements listed above. Thanks for the update on Wreck The Halls bird leader!!! I can’t wait till tomorrow for it! Any idea what time it will be available eastern standard time? Our best guess is 8am UTC = 3am Eastern = 12am Cali. But this is based solely on Summer Pignic and Rovio may choose something different. cool thanks man sounds good to me! Looks like I’m not interested in it right now since this will not hit the PC/Mac versions until at least February. I’ll just play Seasons Greedings this December and play Wreck the Halls in December 2012. All 2011 episodes will be played in 2012, 2012 episodes played in 2013, and so on. ABS was released on PC/Mac a year late, so there will be a one-year lag in seasons episodes. That way, I’ll look forward to starting a new episode right on time for the holiday, not after the holiday has already gone by. your logic seems faulty; we did get Ham’o’ween for PC (along with the rest of the ABS official release) on Halloween. I don’t foresee one-year lags in seasons episodes, and I predict we’ll see at least some Wreck the Halls levels in December. You don’t think there’s a slight difference between a launch and an update? The new logo is on gamecenter!! I keep checking the app store for updates every couple of minutes. Can’t wait! I just checked Game Center on my iPad, and it has the new icon and shows 58 achievements. But on my iPhone, it shows the previous icon and only 54 achievements. Strange. My point was that Game Center shows something different on my iPad than it does on my iPhone. Ummm, I see something else. On my iPhone 3GS, it shows a new icon and there are 58 achievements in all. Well, now it updated on my iPhone too. I guess we can rule out an advent style release again. It’s already December 1st and no update. Unless it’s going to land a little later on. Updates showed up at 4:09 central time. They are downloading now. New episode is a once a day style. A daily present to count down to the holidays. Downloading now, so excited, happy birthday to me! Thanks cconley and everyone else who posted about the release. I’ll be going through and deleting some of the duplicate postings, but we are indeed grateful for your contributions! Have a few extra posts to write today, but it should be fun. Anyways, here’s the main one: Wreck the Halls. YAY!!!! good find! can’t wait to update all these new levels! Also, Mighty Eagle needs to purchased and can be played for free in Poached Eggs ONLY in Chrome. How many more can we expect from rovio? I’m really happy that zynga didn’t buy angry birds! Sorry for spamming but why is Seasons Greedgins in Chrome advent style? Same way it was when it was released on mobile. Basically, it will match “Wreck” one day at a time. Did it come on the phone yet? Was released on iOS and Android on 1 Dec.
Good job! I’m a bit swamped right now, but when I get a chance I’ll add this info to applicable places. Did you look at either the level walkthrough page or the release post?